Contact East Hill Creamery Today! East Hill Creamery is owned by Gary and Betty Burley, two long-time Wyoming county dairy farmers. They started with just 18 cows back in the early 1980s and now have 800 cows, with about 60 of those cows making up the "Cheese Herd." Gary and Betty decided to start making cheese when four of their five kids came back to be a part of the family dairy. All of the cheeses produced by East Hill Creamery are made from raw, unpasteurized cow's milk from their farm. Their cows graze in the pastures and harvest their own forages growing from the unique soils of the farm. In addition to the usual mixture of grasses and other plants, sometimes the cows also graze on rye grass, white clover, blue grass, chicories, dandelions, daisies, and red clover. East Hill takes pride in using their own resources available on the land, such as using timber from the farm to construct the creamery. All of the boards used to age their cheeses in the caves were cut from basswood trees harvested on their land. 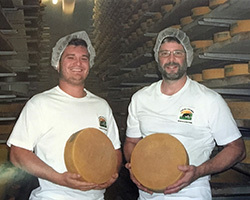 East Hill Artisan Cheese Factory was born and raised in Perry, New York, as were their two cheesemakers - Mike and Dylan. Fresh out of Monroe Community College, Dylan was glad to land a job at his town's newest workplace in December 2015. He was hired as one of the three original cheesemakers. He was trained by French cheese consultant Alex Pellicier to make East Hill's two French alpine-style cheese. In June 2016, Mike was looking for a change in his career path after working as a warehouse manager in the textile industry. Dylan trained Mike in the art of cheesemaking, and the two have been working together ever since. Not only do they make the cheese, they cover virtually every process, from milk to packaging. They also work in the aging room as affineurs, cut and package cheese, maintain sanitary conditions for production, and even go out on the road to promote East Hill cheeses. Underpass is a Raclette-inspired cheese named after the subterranean path built by East Hill for their cows to travel between grazing pastures. Underpass is picked from the caves when still young. It has a creamy mouthfeel and a mild, grassy flavor. Underpass is a fantastic melter. Underpass is a Raclette-inspired cheese named after the subterranean path built by East Hill for their cows to travel between grazing pastures. Underpass Reserve is an older version of East Hill's Underpass, and is cave-aged for 10 months, resulting in a firmer texture. Salinity and earthy tang define the flavor profile of Underpass Reserve and make it a fantastic addition of any fondue, soup, or vegetable dish. This Comte-inspired cheese is named after a lake close to the creamery and weighs in at 60 pounds (27.2kg) a wheel. Silver Lake is the staff favorite. In younger wheels, you will find notes of hazelnuts, brown butter, and cooked milk. As Silver Lake ages, it takes on savory, onion-y notes. Cave-aged for 12 months. This cheese is a fantastic melter.